When one person leaves a job, it’s usually something to do with the employee. When every single person quits, you know the managers have f*cked up. The new owners of a fast food restaurant in Circleville, Ohio, were left with no doubts as to where they’d gone wrong when the staff left a brutal message letting them know exactly how they all felt. According to 10tv, a spokesperson for Sonic America’s Drive-In explained some of the stores had been taken over by new management this week. We recognize that changes like this can be difficult for employees to understand, but are pleased that most current employees will have the opportunity to continue working at the drive-in. As it turns out, however, not all of the employees were quite as happy about the move. Customers in Circleville were probably among the first to learn this, as anyone hoping to pick up a quick burger and shake at the local drive-in recently would have been met by the note advising there weren’t actually any employees around to serve them. The message was written on a piece of paper and stuck in the window of the restaurant, and the disgruntled staff did not hold back. Warning. Due to terrible management the whole store has quit. The company has been sold to people that don’t give a f*ck about anyone but themselves. Sorry for the inconvenience, but our team refuses to work for a company that treats their employees like sh*t when they have put everything into this store. We have worked to hard for to long. We are all off to better things. So to the new owners, F*CK YOU. With every single staff member on the same page, it’s clear there was a real issue with the new management. Employees in Circleville weren’t the only ones to walk out, either. 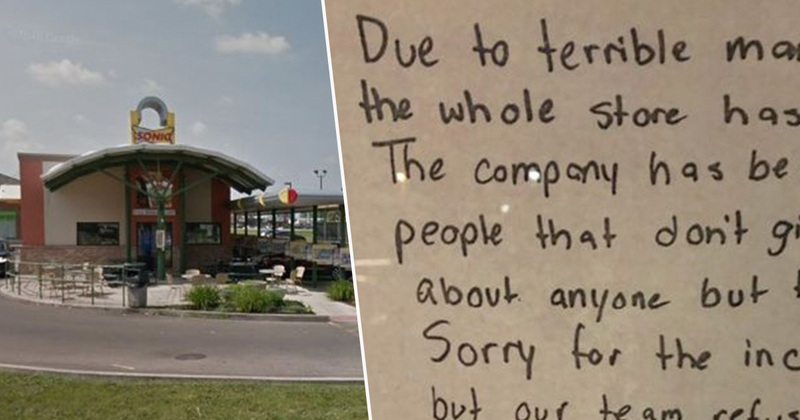 According to Scioto Post, as per 614 now, Sonic workers in Lancaster and Grove City also walked out on the job, and Lancaster employees reportedly left a similar note on their own store window, labeling the company as the ‘trashiest they had ever seen’. I think the employers might have some trouble filling their vacancies after the revelations of former staff members, but it sounds like they had it coming!